I was in the neighborhood this morning so I stopped in to check out the latest offerings at Lower Falls Wine Co. in Newton, MA. I always enjoy chatting with and taking recommendations from the knowledgeable folks there, especially Stephen Pope. My perception is that they play in a couple of categories: Obscure small producers they've discovered on their latest trip to Europe -and- hard to find wines. The hard to find wines are sometimes hard to find because they're from elite producers -or- because they've recently been knighted with a high score/low price from major publications. Although they de-emphasize points as a viable way of assessing wines they do seem to do a good job picking up high-scoring wines. I picked up some wines from each of these categories. 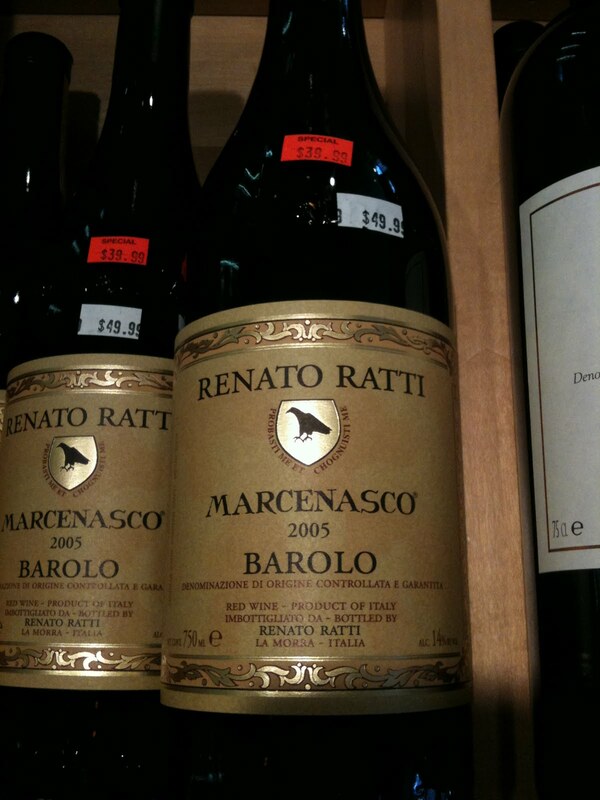 I thought the standout value-play was the 2005 Renato Ratti Marcenasco Barolo at $39.99 net. Number 7 of Wine Spectator's Top 100 list last year, 96 WS/$44 1,200 cases imported. 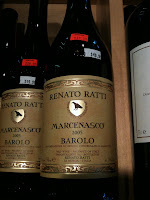 92 median on CellarTracker, best price on Wine-Searcher.com is $44.95 as of this writing. I think there's a perception in the local wine community that Lower Falls is pricey but this is an example of one of their better deals. Don't live near Newton? I see it on Wine.com for $44.99. Prices may vary by state with Wine.com. Just to the right of the Ratti is a wine I've had and would highly recommend: the 2005 La Spinetta (Rivetti) Barbera d'Alba Gallina. Also at $39.99 but eligible for discounting, I thought the wine was fantastic and rated it 93 points. I'd love to get this wine at $32/btl with discount pricing, but doubt I could get 3 cases of interest from my local case club friends. "Les Chaillots" on Stephen's recommendation as a relatively affordable entry point into the ever-tough Burgundy category. We'll give it a whirl and see how it goes. I'm still finding my way around Burgundy figuratively and Stephen was there just a week ago literally. I think Lower Falls is a very nice shop. I only wish their case discounting policy was a little more liberal: 10% off a mixed case, 20% off 3 cases. 3 cases is tough. That's a lot of wine to buy all at once. If they did 20% off a mixed case I'd be a lot more likely to get together with a couple of friends and buy more wine there. Hey you know what would be great? If you subscribed to the WWP so we can keep in touch about wine deals like these. Question of the Day: Any weekend value plays you're scouting out? Share the wealth in the comments section!